The Nvidia GeForce GT 320M or GT320M was presented in the HP dv6t and dv7t series and should be based on a stripped down GT216 core with 24 instead of 48 shader cores. Beware: The GT 320M should not be confused with the newer GeForce 320M in the Apple MacBook 13" 04/2010 laptops, which is a chipset graphics card. In conjunction with the Nvidia 9100M G integrated graphics, the GT 320M supports Hybrid-SLI (only HybridPower). HybridPower is a technique to choose between the integrated and dedicated graphics core, if performance or battery runtime is needed. This works only in Windows Vista. Up to now the user has to use a tool to switch between the GPUs. Later Nvidia wants to switch automatically in the drivers. GeForceBoost is not supported with this card, as there would be no performance gain. The GT 320M features 24 stream processors that do the graphic work of the vertex- and pixel-shaders. Nvidia Shaders are 1-dimensional and can therefore not be directly compared to the 5-dimensional shaders of AMD (HD 4650 e.g.). The performance of the GT 320M is nearly on a level of the old GeForce 9600M GT (altough the 9600M GT features 32 shaders). Demanding Direct X 10 games like Crysis or Dirt 2 can only be played in low details fluently. Older games like Left 4 Dead can be played with high details fluently. More game benchmarks can be found below. The GeForce GT 320M supports PureVideo HD (VP4) to decode HD videos with the GPU. H.264, VC-1, MPEG-2, and MPEG-4 ASP (DivX or xVID) can be fully decoded by the GPU. 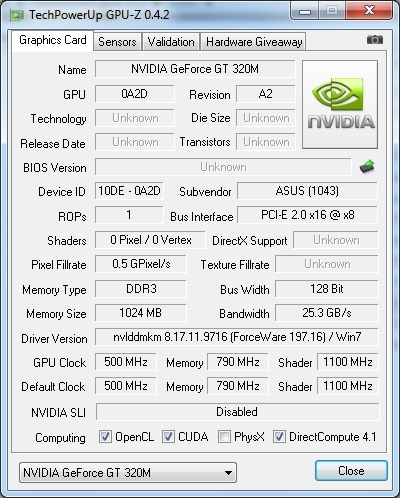 Futhermore, CUDA and DirectCompute are supported to use the processing power of the graphics card for other applications (with modern drivers). PhysX is currently not supported because of the low shader count. The following gaming benchmarks were conducted by our reader Artem on a Asus K50ID (Pentium Dual-Core T440, 3 GB RAM, 197.16 driver) in 1366x768 pixel and no AA or AF. Dirt 2 - 1366x768: Nur in min Details knapp spielbar.